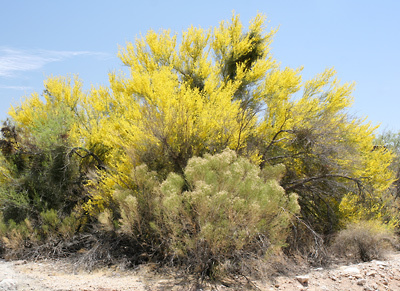 Habitat: Desert, Riparian. It commonly grows in desert washes. 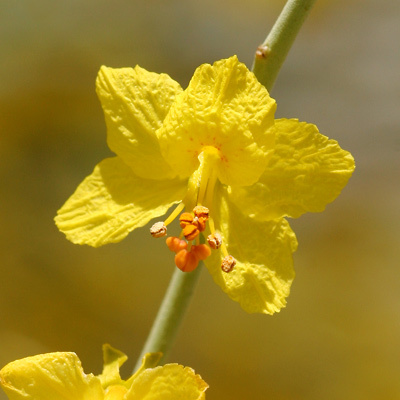 Description: The flowers are up to 1 inch (2.5 cm) wide and have 5 bright yellow petals. The flowers are followed by flat, brown, bean pods. The leaves are bipinnately compound with 1 to 3 pairs of small, oval, bluish green leaflets. There is a spine at each leaf node. The photosynthesizing bark is smooth and blue-green in color. The trees are a spectacular brilliant yellow color when in full bloom. 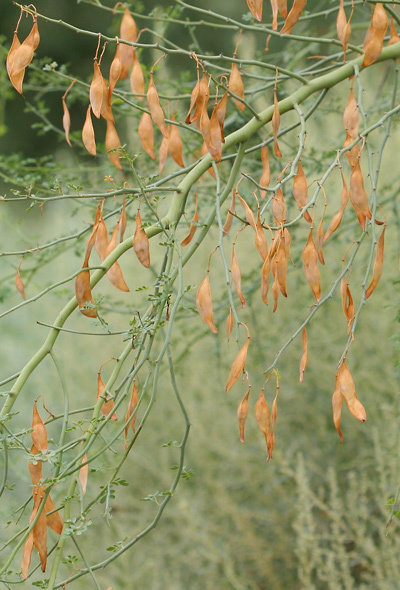 The similar Jerusalem Thorn (Parkinsonia aculeata) has flowers with an orange top petal and long, shoelace-like leaves, while Yellow Paloverde (Parkinsonia microphylla) has lighter yellow flowers with a white upper petal. Allergenic – The pollen is a mild allergen. Edible – The sweet flowers are edible either fresh or cooked.